It has been observed that installing a metal roof makes building owners think more about lightning and the dangers of lightning strikes. There is a perception, or at least a suspicion, that a metal roof will increase the likelihood of lightning striking the building. After all, metal is highly conductive, just like the materials used in lightning rods that are used to attract lightning strikes, so doesn’t it stand to reason that the metal roof will attract lightning, too? The short answer is, no, a metal roof will not make lightning more likely to strike, but it may make a lightning strike less dangerous if it occurs. That’s right, less dangerous, not more. 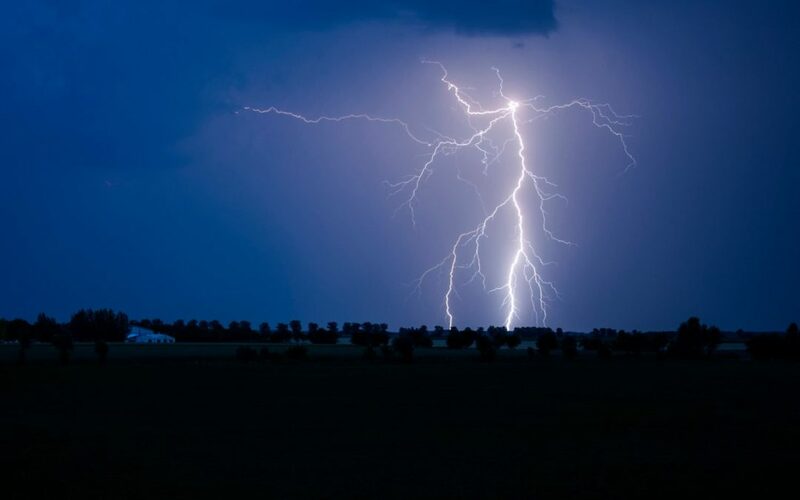 The Metal Construction Association, in its Technical Bulletin MCA13a, breaks the issue down into two issues: the probability of a lightning strike at any particular location, and the consequences of that strike. Lightning has been studied for hundreds of years, and there is good general information about how it works, but many of the details of how it forms and where it strikes are still unknown. That lack of knowledge means that its behavior remains unpredictable. Lightning is a rapid discharge of atmospheric static electricity. There are three major types of lightning strike: Intra Cloud (IC), discharges inside a single cloud, from a highly-charged area of the cloud to a less-charged portion; Cloud-to-Cloud (CC) discharges from a highly-charged cloud to a less-charged cloud, and Cloud-to-Ground (CG) discharges from a highly-charged cloud to the earth. CG is the type that is best understood, and the type we are most concerned with in terms of dangers to life and property. The exact location where lightning discharges appear to be governed by geography and topography, as well as the movements of the storm. When lightning is ready to discharge, it will, whether there is a metal roof handy or not. It is faulty logic to assume that a metal roof attracts lightning strikes similarly to a lightning rod because lightning rods are not made to “attract” lightning. Rather, they are made to channel lightning safely to the ground if it happens to strike the location of the building. Lightning – like any electrical charge – seeks the path of least resistance to discharge. In CG lightning, it’s discharging into the earth, but it has to move through an expanse of air to get there. Trees and buildings are better electrical conductors than air. A tall building provides an easier path by shortening the distance that lightning has to travel through the air. Accordingly, in the general location where the lightning discharges, it will seek the best conductor that is closest to the cloud. A tall tree is more likely to be hit than the short tree next to it. A tall or large building is more likely to be hit than a small, short one. Roof covering material, or other structural materials of the building, are not determinant factors of where it will strike, the placement and size of the building are. The consequences of the strike, however, depend a great deal on what the building is made of, and whether or not it has a lightning protection system. Electricity passes more easily through a good conductor such as copper or steel than it does through a poor conductor such as wood or concrete. The poor conductor has more electrical resistance, which converts some of the lightning’s tremendous electrical energy into heat, possibly causing fires or explosions. A metal building system, with a conductive metal roof and a conductive metal structural frame, gives lightning a low-resistance path to the earth. A metal building may survive a lightning strike with less damage than a similarly sized and located building made of higher-resistance materials. This result is rather counter-intuitive, but it is similar to the fact that during a lightning storm you are safer inside a car – with its metal body – than you are standing next to the car. The actual danger to human life or to property during a lightning strike depends greatly on whether or not the building is occupied, whether it is made of combustible materials, and whether it contains combustible materials. Electronic equipment may be sensitive to the electrical discharge, and therefore is also at risk. Once again, a metal building system, with its non-combustible steel construction, may pose a lower risk than a building made of combustible materials. A lightning protection system gives electrical discharges an easy path to the earth, usually routing it around the outside of the structure. At its most basic, it consists of a metal lightning rod placed so that it is the tallest part of a building, and connected by metal wires to metal rods buried in the earth. (Telecommunications towers, which by design are usually the tallest structures in their immediate surroundings, are often protected by grounding them to a buried ring of copper an inch or thicker, and completely surrounding the tower in a circle several hundred feet across.) A professionally designed lightning protection system may be desirable for buildings whose size and location make lightning strikes more likely, or whose structure and/or contents might be vulnerable to the effects of lighting. If the presence of a metal roof raises the awareness of the need for lightning protection, that might be considered another benefit of metal roofing.